Last year comedian Aman Ali and filmmaker Bassam Tariq gained international attention driving across the U.S. to visit 30 mosques in 30 states over the 30 days of the holy month of Ramadan, a time of fasting and spiritual purification for Muslims. Now the two are visiting colleges and community centers to talk about what they’ve learned and to hear from people across the country in their 30 Mosques/30 States speaking tour, which makes one of only three Indiana stops here at Wabash on Wednesday, February 23 from 6 p.m to 8 p.m. in Detchon International Hall. The presentation is co-sponsored by the College’s Department of Religion, Multicultural Concerns Committee, International Students Office, and Muslim Students Association. Ali and Tariq were featured last year on ABC News, CNN, Fox News, and NPR, as well as numerous local affiliates, as they journeyed across the country from New York City beginning August 12. They logged more than 12,000 miles on the month-long trip. "Originally, this was about the mosques," Ali told reporters toward the end of their journey. "And we've seen some beautiful mosques. But the trip has turned out to be more about the people we meet along the way. We've met some truly wonderful people." The cross-country journey was inspired the previous year after the pair’s Twitter experiment of spending the holy Muslim month of Ramadan at a different New York City mosque each night blossomed into a multimedia blogging project that garnered attention from tens of thousands worldwide. 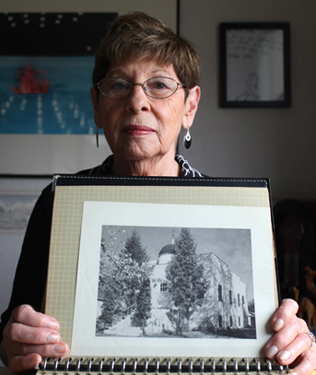 In photo: Aziza Igram, a first generation Muslim American, shares a photo of the Mother Mosque, or as it was called back in the 1930's, the "Moslem Temple," in Cedar Rapids, Iowa. The photo was taken during the 30 Mosques/30 States tour.